Celtic Imagination as Healing Force Part 1 – w cover image The title of my Masters Project at Saybrook says summarizes much of my life quest and much of what I hope to do with my work and life the last few decades I have left. 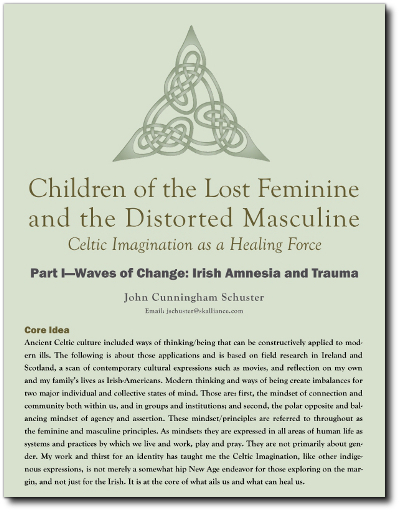 The title is: Children of the Lost Feminine and the Distorted Masculine: Celtic Imagination as a Healing Force for Modern Ills. The result of all the study into Irish-American, Irish, Celtic and family history was this: the Celtic Golden Age in the Middle Ages was a time of balance for human consciousness when the masculine energies of assertiveness had yet to be intensified into patriarchy and aggression, and when the feminine energies of connection had yet to be lost and negated by modern thinking patterns. For me, this discovery added much to understanding of my life, my masculine identity, my family life and history and career. And the larger context for my life also became clearer: violence and war, corporate and business life and the ills of poverty and ecological deteriorization. Download Part I of this multi-part series. A whole lot and way more than we know. Here is my attempt to learn from my Irish ancestors. I went to Ireland and Iona, Scotland for a month in the fall of 2013 on a soul retrieval trip, the one I have owed myself but was too unaware to take earlier. 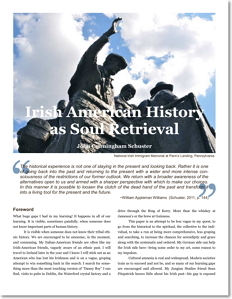 For those who want to get a quicker taste of my project, this condensed version of the original paper offers the most important highlights and take-aways from my attempt to learn from my Irish ancestors. Coaches and therapists work in the same two energy fields—the first, those cognitive places where we think, and the second, the those pre-verbal, old brain places from which our core energy emerges. Coaches and therapists have different terms and ways of working with these inner energy fields as we interact in the world of work, families, and communities. 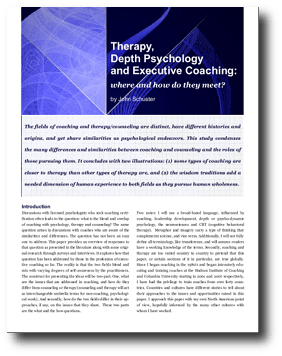 The article “Therapy, Depth Psychology and Executive Coaching” is my attempt to describe how these two professions overlap and blend. I got a grad school credit for it, so it is a bit more academic than I most often write, but the charts capture the big thoughts in compressed form. You can scan it in a few minutes, or try to absorb it deeply and spend some time. Hope you find some value.